What can you create & sell? Why create & sell on ActivityCircle? activities aligned with CCSS, NGSS or state content standards. activities involving reading, writing, graphic organizers, questioning, formative assessments, vocabulary, book-based comprehension skills and more. activities that showcase your teaching speciality & classroom know-how. Unleash your creativity, expertise & imagination. We are a growing community of teacher authors, teacher buyers and parent buyers. We empower teachers to create businesses using their expertise & classroom know-how. We are the "App Store" equivalent for the teaching world - you create interactive mini-apps on our platform that students all over the world interact with. Become a seller for free. 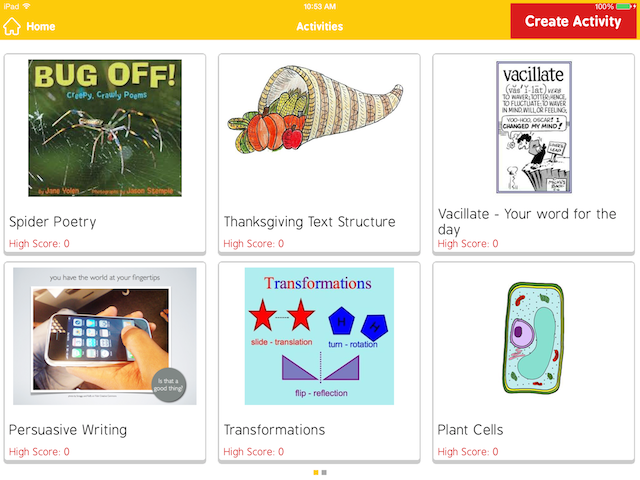 Create interactive activities using your content & pedagogical expertise. No coding knowledge is required. List your high-quality activities in the activity catalog. Specify a price. Earn when teachers purchase your activities. Earn when subscribing users use your activities. Your activities will be used by teachers & students world over. Impact student learning worldwide with your expertise. Can you give me ideas on what to create for sale? Create activities that align with Common Core State Standards (CCSS) and Next Generation Science Standards (NGSS). Create non-fiction reading comprehension along with question sets, cross-curricular reading & questioning, math activities to teach & practice concepts, prompts for writing, question sets to go along with books students read and so forth. Activities you currently use in the classroom may be transformed to activities on the iPad using ActivityCircle. If you create activities for selling on marketplaces like TeachersPayTeachers, those activities may be upgraded and made iPad-ready on the Activity Spot platform. In gist, the material you create for your classroom is relevant, applicable and appropriate for similar classrooms worldwide. What skills or expertise do I need to create? What is the learning curve? Your teaching expertise, knowledge of a content area and imagination are all you need. The platform provides an easy-to-use interface with academic activity type templates where you can plug in your content. We do a pretty good job of keeping techie jargons and complexities under the hood. Learning curve is minimal - we have teacher-authors up and running in 5 minutes. You register for free and login just like any user on ActivityCircle. You will then become a seller by specifying a credit or debit card to Stripe - our payments processing partner. There are no upfront fees or costs for you to become a seller and create activities for sale. When users of ActivityCircle, purchase your activity, you will be credited (via Stripe) about 70% of the purchase price. ActivityCircle allows users to upgrade to a premium account for an annual payment. These users get to use your activities without explicitly purchasing it. ActivityCircle tracks usage of activities by these users and credits your account (via Stripe) a royalty fee calculated based on the number of premium users using your activities. Who owns copyrights to my work? You own the copyrights to your work. The ActivityCircle platform acts as a content delivery mechanism that helps you publish your content and for other users to use your content. As the owner of copyrights to your work, you should only upload materials that you have created. You may not upload books authored by others, copyrighted images that you don't have permission to use commercially, or anything else that would be copyright infringement. The questions on your head should be on this FAQ! Email us your question and you will receive a prompt response. Email us at folks@frolyc.com. Help us update this FAQ with your questions.